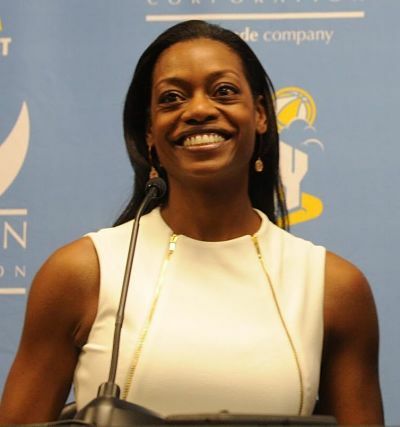 Amber Stocks was named Chicago Sky coach and general manager on Tuesday. Photo by Randy Belice/NBAE. In late October, the Chicago Sky announced that head coach and general manager Pokey Chatman would not be returning after six seasons with the franchise. A six-week search resulted in Los Angeles Sparks assistant Amber Stocks being named Chicago’s new head coach and general manager. The announcement was made official Tuesday. “During this process we interviewed former WNBA coaches, WNBA assistants, former NBA coaches, NBA assistants, college men’s and women’s coaches, we even interviewed people who had never coached before but were interesting people,” Sky owner Michael Alter explained. Stocks attended the University of Cincinnati, where she was named Defensive Player of the Year in three out of her four seasons. She served as an assistant coach at Xavier University (2002-2009), Women’s Director of Basketball Operations for the University of Tennessee (2000-2002), and was a strength and conditioning coach for the University of Notre Dame (1999-2000). She was also the program director and head coach of the Tucson HEAT Basketball Association in Arizona (2009-2013) and a college basketball analyst for ESPN3. Most recently, Stocks helped the Los Angeles Sparks on their magical run to the 2016 WNBA championship. Stocks inherits a team with one of the best players on the planet in Elena Delle Donne. Chicago also has a nice supporting cast that includes dynamic point guard Courtney Vandersloot, All-Star guard Cappie Pondexter, Allie Quigley, Tamera Young, Jessica Breland, and Imani Boyette. Sky fans and upper management are hopeful that after four straight playoff exits, Stocks is the missing element to put the Sky over the top. Sherron Shabazz: What would you say helped prepare you the most during your time in Tennessee and LA for the GM position in Chicago? Amber Stocks: What probably helped me the most with the GM position in Tennessee, Pat Summitt would talk about choosing who she was going to recruit. Obviously there was a process to recruiting, but she was very selective about choosing the right players and the process of deciding what needed to be added to the team and what we could probably pass by, even if it was a talented player – but did that player have the right elements to complement the team as a whole. That’s a general manager perspective that I learned with Pat Summitt, also, with Los Angeles Penny Toler – one of the best general managers if not the best general manager in the WNBA. I hope to follow in her shoes and learn from her guidance as far as being smart and particular. Looking for the things that the average eye may not see. Being able to be in tune with the pulse of the team, being able to really have a good feel for what the team needs to do, which every team wants to do, to win a championship. SS: What points did Sky owner Michael Alter emphasize to you during the interview process? AS: You know what, I actually don’t know what specific things he was looking for. As I said before, I know what I bring to the table and I know what I have to offer. I knew I was the right fit for Chicago and I knew Chicago was the right fit for me and my family. I stay focused on knowing what I know, managing what I could manage, and leave the results to Michael. SS: You got see the Chicago Sky a few more times than normal in the regular season and in the playoffs. What stood out to you the most about this group of players? AS: Team basketball. When players were out because of injury or when they were in it did not matter. Chicago was going to be a tough match-up every single night. This team plays team basketball and plays team basketball very well. They know how to move the basketball, they share the ball very well, and they have fun playing together. That’s hard to guard when you have unpredictable offensive weapons. SS: Will you implement things that you may have picked up from Brian Agler into your team? AS: You know I’ve been fortunate to have learned under a lot of great head coaches, Brian Agler being one of them. There are definitely going to be things that I implement from all the coaches that I’ve worked with. Kevin McGuff, things that I learned from Pat Summitt at Tennessee, Muffet McGraw at Notre Dame, and of course Brian Agler. You’ll see a little implementation of all of those as well as things that I learned when I was a player from my college coach, Laurie Pirtle. SS: What style of play do you anticipate having with this team given the personnel? AS: Well, the way that we play right now is a good fit for us. I intend to keep a lot of that flow. The only thing I would probably add in with the way that we play now is the heavy emphasis on transition basketball and quick shots in the shot clock. You may see a little bit more of a flow game with that that flows into our offense, obviously if we could get a shot before getting into the offense that would be ideal. You’ll see a lot of similarities. With the WNBA, our shot clock is such a short shot clock and the offensive rebound reset is only 14 seconds, so it doesn’t allow for a whole lot of creativity or complicated offensive schemes. It really comes down to empowering your players to make plays. That is something that I’m very committed to, empowering each one of our players to make big plays. SS: Candace Parker recently said that Elena Delle Donne is the toughest player to guard in the league. How excited are you to have Elena on your side now? AS: Having Elena in a Sky uniform makes a big difference. Again, one of the things that makes Elena hard to guard is her teammates. Her teammates find a way to get her the ball in a good position. The way this team moves the basketball and plays so well together allows a star player to shine. In another environment it might be a little different. In the Chicago Sky environment Elena can shine, Cappie can shine, Allie Quigley can shine, Jessica Breland, we have the right tools for multiple players to step up and shine. SS: There are some young players on the roster like Imani Boyette, Cheyenne Parker, and Betnijah Laney that have pretty high ceilings in my opinion. What are your plans as far as player development for the young players on the team? AS: That’s a great question. Player development is becoming its own specialized entity. Coaching is its own set of challenges and expertise. I really am going to lean on the expertise of those who do player development day in and day out. Dorian Lee with B’ Ball 101 is one of the masterminds of player development and I plan to lean on his knowledge and expertise in order to make my players better. SS: You’re the head coach and general manager of the Sky now and you won a WNBA title, is this the best year of your professional career? AS: Well, that’s yet to be determined. This will be a very, very, very special year. I’m the type of person that doesn’t like to make comparisons and say, “ this is best,” or “this is better.” Every team that I coached is special. Every single young lady that I’ve had the opportunity to coach over the course of 17 years is my favorite player. Every team is my favorite team. This team is undoubtedly going to always be special and this season is going to be very special.